The research was designed to counter a World Health Organization decision to classify diesel exhaust as a carcinogen. 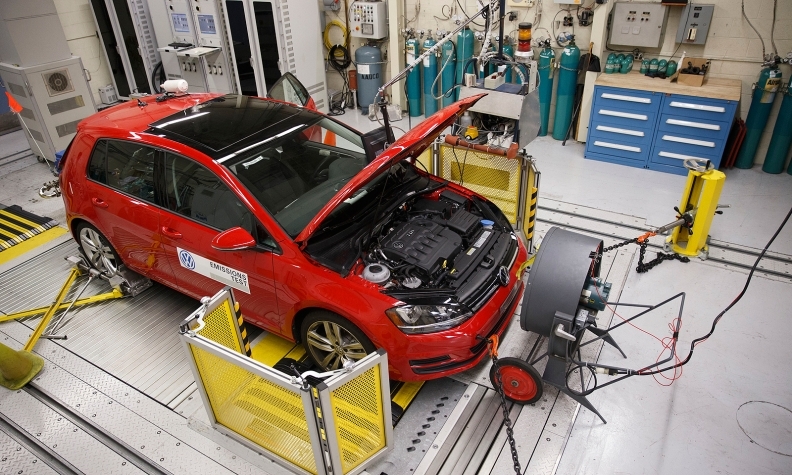 FRANKFURT – Volkswagen Group said that some staff members at the VW brand's technical development division and at Volkswagen of America had been aware of tests in which monkeys were exposed to toxic diesel fumes. VW did not identify the employees, which included some members of its legal department. The automaker said the study was never discussed in any management board meetings, after German daily Bild earlier reported that an internal e-mail showed that at least some senior managers were informed about the design of the research. Members of VW Group's supervisory board have called for an inquiry into the tests, German media reported on Monday. The New York Times reported on Friday that the European Research Group on Environment and Health in the Transport Sector, also known as EUGT, commissioned the study, which was designed to defend diesel following revelations that the fuel's exhaust fumes were carcinogenic. EUGT received all of its funding from VW, Daimler and BMW, The New York Times said. It remains unclear whether all the automakers were aware of monkeys being used in the experiments. "I will do everything possible to ensure that this matter is investigated in detail," VW Supervisory Board Chairman Hans Dieter Poetsch said in a statement. "Whoever is responsible for this must of course be held accountable." The paper reported that a 2014 trial was conducted in a U.S. laboratory in which 10 monkeys inhaled diesel emissions from a VW Beetle. In a further twist, the Beetle model used in the test was among the vehicles that were rigged to conform to test limits, The New York Times reported. Reuters could not immediately confirm the details of the study and a representative for EUGT, which was dissolved last year, could not be reached for comment. VW, Daimler and BMW on Saturday all denounced the study. Revelations about the study are the latest aftershock from the VW Group's emissions-rigging scandal, which are continuing to rock the auto industry. Daimler said it would start an investigation into the study, while BMW distanced itself from the trial, saying it had taken no part in its design and methods. It said it was "in no way influenced the design or methodology of studies carried out on behalf of the EUGT," adding that it does not carry out experiments involving animals and had no direct role in this study. Bernd Althusmann, a member of VW's supervisory board representing the automaker's home state of Lower Saxony, said such experiments were "absurd and inexcusable," German news agency DPA reported on Monday. Althusmann demanded "harsh consequences" for whoever was responsible for the study, DPA quoted him as saying. Bernd Osterloh, VW's works council chief, who is also on the automaker's board, called for a detailed investigation into the matter, German daily Die Welt said. Commissioning such a study involving live animals did not reflect ethical or moral behavior, Osterloh said. "If the people who were responsible at the time are still on board, then personnel consequences must be considered," he said. The German government said on Monday that any emissions testing on monkeys or people were unjustifiable. "These tests on monkeys or even people are in no ethical way justifiable and raise many critical questions about those who are behind the tests," government spokesman Steffen Seibert told a regular government news conference in Berlin. The EUGT commissioned the Lovelace Respiratory Research Institute (LRRI) in Albuquerque, New Mexico, which then designed an experiment where monkeys squatted in airtight chambers, inhaling fumes from a diesel Beetle, The New York Times reported. To keep the animals calm during the four hours they breathed fumes, lab workers set up a television showing cartoons, the paper said. The EUGT research was designed to counter a 2012 decision by the World Health Organization to classify diesel exhaust as a carcinogen, the paper said.